Taralli Plain Savory Snacks for sale. Buy online at Zingerman's Mail Order. Gourmet Gifts. Food Gifts. 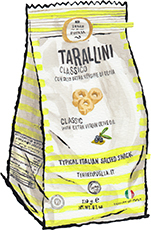 Taralli are everywhere in Italy. Even the smallest grocery stores will sell at least a half dozen kinds of 'em. When you eat out, there's a good chance that your bread basket will include a few taralli. And depending on the restaurant, the taralli may be better than the bread. Because that's the thing: good taralli are really simple, but really tasty. They look like tiny bagels, about the size of a quarter. They're made with wheat and olive oil and they're crunchy and flaky and they practically melt in your mouth as you eat them. As soon as you finish one handful you're already reaching for another. They're the perfect crisp little crackers to toss in a bowl for an antipasto spread. Eat them like an Italian, with cheese, salami, and olives. Crumble them up on top of soup for a new take on oyster crackers. Or just snack on them straight from the bag. Just be careful or you might finish them all in one sitting.